Is this Friday good (enough) for potato planting? Gardening folklore calls for planting potatoes on Good Friday, but that date can fluctuate from the wintry throes of March to somewhat balmy days in late April. In 2019, Easter falls on the latest date in nearly a decade, April 21, placing Good Friday on April 19, weeks later than last year’s Good Friday on March 30. Still, winter weather lingered especially long this year in Iowa, so it might take another two weeks for soil temperatures to be ideal for planting. This map from ISU Extension indicates, as of the first week in April, that soil temperatures are not yet at 45 degrees Farenheit, which is generally recommended for potato planting. 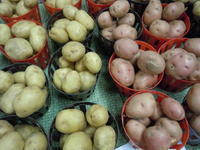 Iowa State University Extension advises gardeners to plant potatoes in late March or early April in southern Iowa; early to mid-April in central Iowa; and mid to late April in northern portions of the state. New potatoes are then generally ready to harvest by July. Gardening lore that calls for potato planting on Good Friday is likely tied to moon phases. The date of Easter changes every year, but is set as the Sunday following the paschal full moon, which is the full moon that falls on or after the vernal, or spring equinox. Generally, that would set Good Friday during the waning of the moon, the time to plant below-ground crops. One way to avoid the soil temperature question is to plant potatoes in large containers or straw bales, either of which would be fine to do in April.